As many of you know, Metro has been working to increase space for cyclists on its subway and light rail cars — and will be taking out a few seats here and there to help. Metrolink is getting in the act, too — and vastly increasing room for bikes on two rail cars on the Inland Empire line. If cyclists respond, Metrolink says it’s prepared to add 10 more bike cars to its fleet. As part of a pilot program, Metrolink will introduce its first two “bicycle cars,” passenger railcars outfitted with space for at least 18 bicycles, instead of two slots like Metrolink’s other railcars. The agency hopes this will encourage more bicyclists to take the train to their destination. 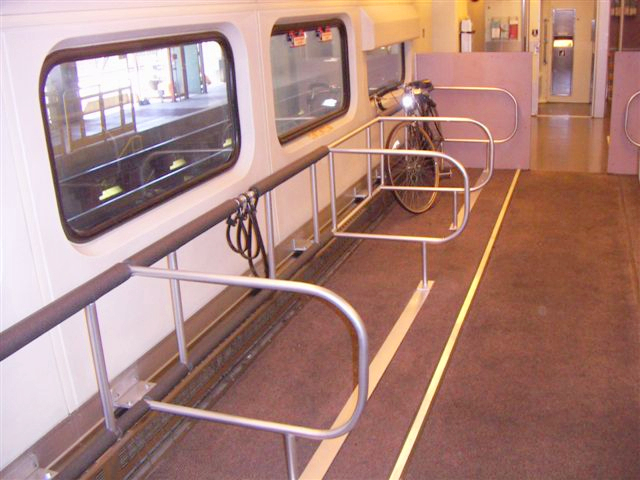 To accommodate the additional bicycles, Metrolink crews removed 29 passenger seats on the bottom level of one of its railcars that traditionally seats up to 149 people. Metrolink used in-house resources to design and retrofit existing cars with additional storage for bicycles. The agency coordinated with bicycle advocates on the design, which was ultimately approved by the Federal Railroad Administration. Initially, Metrolink’s “bicycle cars” will debut on the Inland-Empire line weekend beach trains, where the demand is highest for additional bicycle storage space. 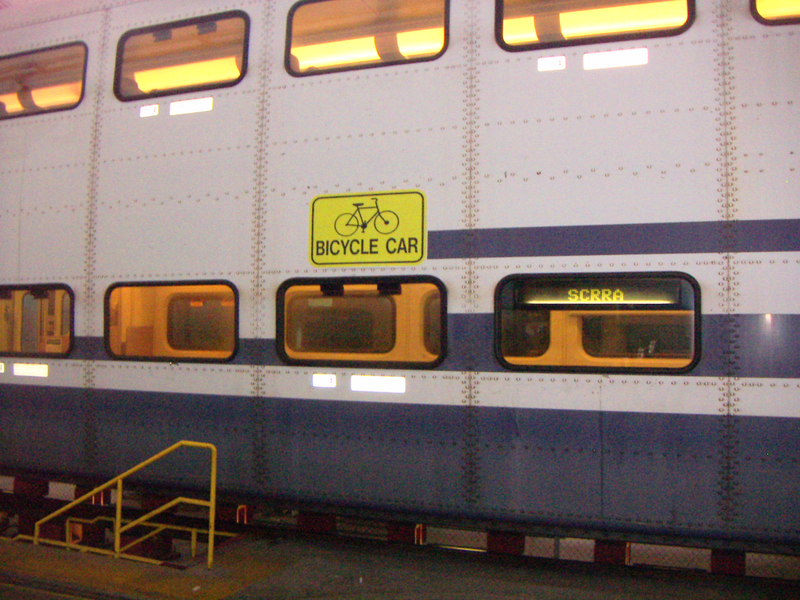 Bicycle cars can be identified by yellow decals located on the outside of the rail car. Metrolink is prepared to add up to 10 additional “bicycle cars” to its fleet, depending on the success of the pilot program. This is FANTASTIC! Metrolink/SCRRA is on a roll. Simply amazing to see the transformation of the agency. So many innovative initiatives coming out of it in recent months. I never ride the inland empire line though…always heading south towards Irvine/Oceanside…we need a car or two on these lines! If there was weekend service…just imagine! Amtrak is getting more and more un-bike friendly these days and removing almost all bike space on their cars…if Metrolink took that business I and my friends would be some seriously happy campers. As well as the businesses we would be frequenting in the OC/San Diego County Areas. I agree with David, its so refreshing to see Metrolink respond to the needs of the riders and introduce service and amenities to encourage more. I just hope they are also working on base things like TAP/Fare issue. They absolutely need to keep the EZ pass transfers and Rail2Rail though I am not too worried at the moment. I don’t recall seeing a post for the Del Mar trains on here but just another example of Metrolink trying to encourage better ridership by expanding service for events. The baseball trains too are popular from what i hear. On that note, Metrolink should team up with OCTA to promote Disneyland service. I’m amazed that people don’t know there is a station down the street. It’s mainly from OCTA’s terrible service and advertisement of it and have a closing time train (around midnight) to bring people back to L.A.
We did have a post about the Del Mar races — but we’ve been slow in the past at times to get Metrolink info on The Source. We’re working with them to do better at that, given reader interest on Metrolink is high and, of course, L.A. Union Station is Metrolink’s biggest station. I recently interviewed Metrolink CEO John Fenton and I should have that post ready to roll soon. Metrolink is doing a lot lately in the right direction but a large problem still persists, the frequency of service. Metrolink does not operate at hourly or even 30 minute headways the way that caltrain or metra do for example, which is crucial for successful regional rail. Often, trains run 2 to 3 hours apart and are very limited on weekends if even present at all. Metrolink is getting a lot right in terms of amenities, special service, etc. but in general operations, it just doesn’t run often enough to be an attractive travel option for most people yet. It was a bad decision for metrolink to cut late night service on the ventura county line supposedly because of low ridership since it was tested for such a short time, there was no chance for the service to “settle in”, some transit services have to be well established for people to even be aware of them let alone start using them. there needs to be a sense of permanence. Also, many people may head somewhere midday or in the morning but will find that they can’t get home via train because they have to leave before 6:40 pm (the last train on the ventura county line), this means they wont use the train at all because they have to tailor their day around the early train times. Horay! Metrolink scores–what a great way to adapt extra rail cars!! Thanks Gray Crary! Very impressed–and a big thank you. Metrolink has always been very accommodating to me while traveling with a bike (although bike storage was a bit limited), but this takes it to the next level. This is great. Bike camping just got easier! Woo-hoo!!! It looks like this will require bike locks. Usually, I sit right by my bike on the Antelope Valley Metrolink, and watch it the entire time, not using bike locks. But, in a separate train car, I’d definitely need to bring locks, which is going to require a lighter lock if I take my “good” road bike. Ah, well. These cars are not on the AV Line yet, so I have time to prepare. Maybe that titanium lock I contributed to on Kickstarter will be ready by then . . .
Also, what about stops where the train stops for only moments? Will they give you enough time to get to the bike car to retrieve your bike or do you risk the train taking off with your bike? @conner yes! The time has come to recognize that Metrolink is no longer “peak commuter” service anymore and is going to have to grow into a Caltrain or Metra type role. The main thing I see holding this back though are the private railroad operators and the funding. While 30 minute headways and late night service is much needed the prices already are pretty steep. So it’s hard to find a way to accomplish this without pricing out much of the ridership. @Michele Chavez – All stops on Metrolink are announced a minute or so in advance, I’m assuming you would go downstairs, unlock your bike, and wait by the door before you get to the station just like the current bike riders do. @Gary – Thanks. I guess I didn’t think that through very well. I was assuming that the car was dedicated to bikes and that I’d be seated in another car. If this works out and they add bike cars to the Antelope Valley Line, this should work out great for getting a whole group of us to CicLAvia. Wow, I can’t believe this. This means more seating lost for passengers that ride Metrolink Rail because of these “bikers” that begs so much for everything. This is a fact. I can’t believe Metro is removing a few seats from the subway and light-rail just to increase bike space. How unfair. I’m so tired of this “bike-mentality” going on mass transit, it’s ruining everything. These bikes racks and compartments are worst hing to mass transit. Another reason why I hate socialism. This what I think. Rather you agree or disagree with me, I’m not changing my opinion. I’m stand up for riders that don’t use bikes and are tired of seeing seats being lost due to bikers. The bikers you be happy they can bring their bikes onto the train but there no need for increases space because this means more seating lost and it’s unfair for regular riders. Is there any way to increase space without losing the seats? betterfuture, Metrolink is taking cars slated to be retired, then overhauling them and converting the lower level to bicycle space, and adding them to the trains. This means there’s actually a net INCREASE in seats as they are adding a sixth car to what would normally be five car trains. In doing so they are also saving some cars from the scrap heap. Security wise, I’d prefer keeping my bike in site. It is awkward standing duration of trip with bike though. Sitting with bike gets in the way of other commuters and can be safety risk. Is a bike corral option that can both maximize bike storage space and provide ease of access? By the way – I like idea of bike-friendly trains and look forward to solutions that work for byclists and those who aren’t. A) They are usually called “cyclists” not “bikers”. “Bikers”, IME, are Motorycle users. B) These spaces being in one car free up space in the other cars for seats, or luggage, strollers, etc. As it was there were too many seats on LA Metro’s rail cars to facilitate efficient loading and unloading, especially given the rather short length of average trips. And the newly created spaces on LA Metro’s cars are certainly not being used exclusively by bicycles! For example, the TAP Turnstile contractors were using it to move their tool and parts carts around the Red/Purple Lines last year. Also having the bicycles in one car means no hunting for a free space from car to car thus ensuring quicker station stops and maintaining on-time operations. C)Bicycles on Mass Transit equals “Socialism”, huh? Who knew!?! Remind me again which mode of transportation is not subsidized? I love this idea. I’m just about to move back home to San Dimas and would love to be able to take my bike on the metro to work. I’ll be taking the metrolink from covina to downtown, then purple line to the western/wilshire, then biking 5 miles to beverly hills! I’m going to see if there is a locker at the western/wilshire stop. but if not, i hope i can take my bike aboard for the whole trip! It looks like there are bike lockers at Wilshire/Western. Here is a map with locker locations.